Technology and Citizen Engagement: Friend or Foe? Within the open government debate, there is growing interest in the role of technology in citizen engagement. However, as interest in the subject grows, so does the superficiality of the conversations that follow. While the number of citizen engagement and technology events is increasing, the opportunities for in-depth conversations on the subject do not seem to be increasing at the same rate. This is why, a few weeks ago, I was pleased to visit the University of Westminster for a kick-off talk on “Technology and Participation: Friend or Foe?”, organized by Involve and the Centre for the Study of Democracy (Westminster). It was a pleasure to start a conversation with a group that was willing to engage in a longer and more detailed conversation on the subject. My talk covered a number of issues that have been keeping me busy recently. On the preliminary quantitative work that I presented, credit should also go to the awesome team that I am working with, which includes Fredrik Sjoberg (NYU), Jonathan Mellon (Oxford) and Paolo Spada (UBC / Harvard). For those who would like to see some of the graphs better, I have also added here [PDF] the slides of my presentation. I have skipped the video to the beginning of my talk, but the discussion that followed is what made the event interesting. In my opinion, the contributions of Maria Nyberg (Head of Open Policy Making at the Cabinet Office) Catherine Howe (Public-i), as well as those of the participants, were a breath of fresh air in the current citizen engagement conversation. So please bear with me and watch until the end. I would like to thank Simon Burral (Involve) and Graham Smith (Westminster) for their invitation. Simon leads the great work being done at Involve, one of the best organizations working on citizen engagement nowadays. And to keep it short, Graham is the leading thinker when the issue is democratic innovations. Below is also an excellent summary by Sonia Bussu (Involve), capturing some of the main points of my talk and the discussion that ensued (originally posted here). The title of yesterday’s event, organised by Involve and Westminster University’s Centre for the Study of Democracy, posed a big question, which inevitably led to several other big questions, as the discussion among a lively audience of practitioners, academics and policymakers unfolded (offline and online). Tiago Peixoto, from the World Bank, kicked off the debate and immediately put the enthusiasm for new technologies into perspective. Back in 1795, the very first model of the telegraph, the Napoleonic semaphore, raised hopes for – and fears of – greater citizen engagement in government. Similarly the invention of the TV sparked debates on whether technology would strengthen or weaken democracy, increasing citizen awareness or creating more opportunities for market and government manipulation of public opinion. So do new technologies mobilise more people or simply normalise the participation of those that already participate? The findings on the matter are still conflicting. 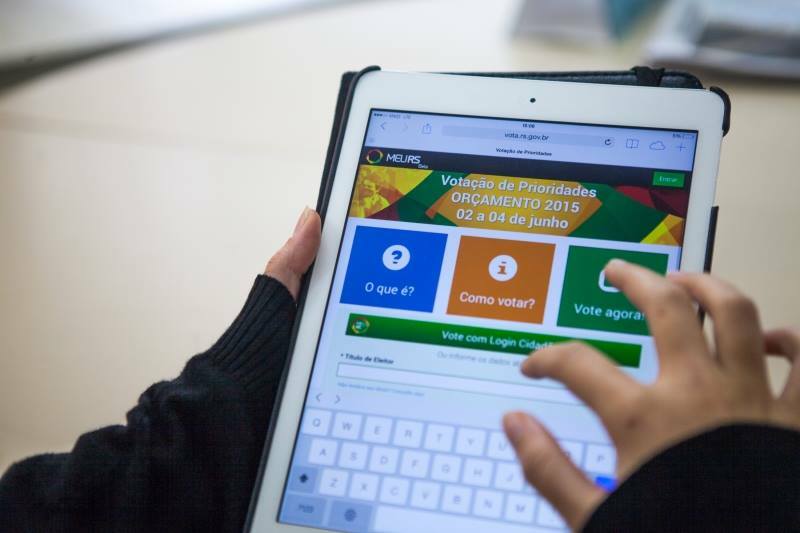 Tiago showed us some data on online voting in Rio Grande do Sul participatory budgeting process in Brazil, whereby e-voting would seem to bring in new voters (supporting the mobilisation hypothesis) but from the same social strata (e.g. higher income and education – as per the normalisation hypothesis). In short, we’re still pretty much confused about the impact of technology on democracy and participation. Perhaps, as suggested by Tiago and Catherine Howe from Public-i, the problem is that we’re focusing too much on technology, tempted by the illusion it offers to simplify and make democracy easy. But the real issue lies elsewhere, in understanding people and policymakers’ incentives and the articulation (or lack thereof) between technologies and democratic institutions. As emphasised by Catherine, technology without democratic evolution is like “lipstick on a pig”. The gap between institutions and technology is still a big obstacle. Catherine reminded us how participation often continues to translate into one-way communication in government’s engagement strategies, which constrains the potential of new technologies in facilitating greater interaction between citizens and institutions and coproduction of policies as a response to increasing complexity. As academics and practitioners pitch the benefits of meaningful participation to policy makers, Tiago asked whether a focus on instrumental incentives might help us move forward. Rather than always pointing to the normative argument of deepening democracy, we could start using data from cases of participatory budgeting to show how greater participation reduces tax evasion and corruption as well as infant mortality. He also made a methodological point: we might need to start using more effectively the vast array of data on existing engagement platforms to understand incentives to participation and people’s motivation. We might get some surprises, as findings demystify old myths. Data from Fix My Street would seem to prove that government response to issues raised doesn’t increase the likelihood of future participation by as much as we would assume (28%). ** But this is probably a more complicated story, and as pointed out by some people in the audience the nature and salience of both the issue and the response will make a crucial difference. Catherine highlighted one key problem: when we talk about technology, we continue to get stuck on the application layer, but we really need to be looking at the architecture layer. A democratic push for government legislation over the architecture layer is crucial for preserving the Internet as a neutral space where deeper democracy can develop. Data is a big part of the architecture and there is little democratic control over it. An understanding of a virtual identity model that can help us protect and control our data is key for a genuinely democratic Internet. Maria Nyberg, from the Cabinet Office, was very clear that technology is neither friend nor foe: like everything, it really depends on how we use it. Technology is all around us and can’t be peripheral to policy making. It offers great opportunities to civil servants as they can tap into data and resources they didn’t have access to before. There is a recognition from government that it doesn’t have the monopoly on solutions and doesn’t always know best. The call is for more open policy making, engaging in a more creative and collaborative manner. Technology can allow for better and faster engagement with people, but there is no silver bullet. Some people in the audience felt that the drive for online democracy should be citizen-led, as the internet could become the equivalent of a “bloodless guillotine” for politicians. But without net neutrality and citizen control over our own data there might be little space for genuine participation. *This point was edited on 12/07/2014 following a conversation with Tiago. I am also thankful to the UK Political Studies Association (PSA), Involve and the University of Westminster for co-sponsoring my travel to the UK. I will write more later on about the Scaling and Innovation Conference organized by the PSA, where I was honored to be one of the keynote speakers along with MP Chi Onwurah (Shadow Cabinet Office Minister) and Professor Stephen Coleman (Leeds). Having a refined understanding of what leads people to participate is one of the main concerns of those working with citizen engagement. But particularly when it comes to participatory democracy, that understanding is only partial and, most often, the cliché “more research is needed” is definitely applicable. This is so for a number of reasons, four of which are worth noting here. The “participatory” label is applied to greatly varied initiatives, raising obvious methodological challenges for comparative research and cumulative learning. For instance, while both participatory budgeting and online petitions can be roughly categorized as “participatory” processes, they are entirely different in terms of fundamental aspects such as their goals, institutional design and expected impact on decision-making. The fact that many participatory initiatives are conceived as “pilots” or one-off events gives researchers little time to understand the phenomenon, come up with sound research questions, and test different hypotheses over time. The “pilotitis” syndrome in the tech4accountability space is a good example of this. When designing and implementing participatory processes, in the face of budget constraints the first victims are documentation, evaluation and research. Apart from a few exceptions, this leads to a scarcity of data and basic information that undermines even the most heroic “archaeological” efforts of retrospective research and evaluation (a far from ideal approach). The semantic extravaganza that currently plagues the field of citizen engagement, technology and open government makes cumulative learning all the more difficult. Precisely for the opposite reasons, our knowledge of electoral participation is in better shape. First, despite the differences between elections, comparative work is relatively easy, which is attested by the high number of cross-country studies in the field. Second, the fact that elections (for the most part) are repeated regularly and following a similar design enables the refinement of hypotheses and research questions over time, and specific time-related analysis (see an example here [PDF]). Third, when compared to the funds allocated to research in participatory initiatives, the relative amount of resources channeled into electoral studies and voting behavior is significantly higher. Here I am not referring to academic work only but also to the substantial resources invested by the private sector and parties towards a better understanding of elections and voting behavior. This includes a growing body of knowledge generated by get-out-the-vote (GOTV) research, with fascinating experimental evidence from interventions that seek to increase participation in elections (e.g. door-to-door campaigns, telemarketing, e-mail). Add to that the wealth of electoral data that is available worldwide (in machine-readable formats) and you have some pretty good knowledge to tap into. Finally, both conceptually and terminologically, the field of electoral studies is much more consistent than the field of citizen engagement which, in the long run, tends to drastically impact how knowledge of a subject evolves. These reasons should be sufficient to capture the interest of those who work with citizen engagement. While the extent to which the knowledge from the field of electoral participation can be transferred to non-electoral participation remains an open question, it should at least provide citizen engagement researchers with cues and insights that are very much worth considering. (BTW, if you are a voter in certain US states, the odds of being hit by a meteorite are greater than those of casting the deciding vote). For those working with participatory governance, the question that remains is the extent to which each of these lessons is applicable to non-electoral forms of participation. The differences between electoral and non-electoral forms of participation may cause these techniques to generate very different results. One difference relates to public awareness about participation opportunities. While it would be safe to say that during an important election the majority of citizens are aware of it, the opposite is true for most existing participatory events, where generally only a minority is aware of their existence. In this case, it is unclear whether the impact of mobilization campaigns would be more or less significant when awareness about an event is low. Furthermore, if the act of voting may be automatically linked to a sense of civic duty, would that still hold true for less typical forms of participation (e.g. signing an online petition, attending a community meeting)? The answer to this “transferability” question is an empirical one, and one that is yet to be answered. The good news is that while experiments that generate this kind of knowledge are normally resource intensive, the costs of experimentation are driven down when it comes to technology-mediated citizen participation. The use of A/B testing during the Obama campaign is a good example. Below is an excellent account by Dan Siroker on how they conducted online experiments during the presidential campaign. Bringing similar experiments to other realms of digital participation is the next logical step for those working in the field. Some organizations have already started to take this seriously . The issue is whether others, including governments and donors, will do the same.